Architecture that is more than just… more. 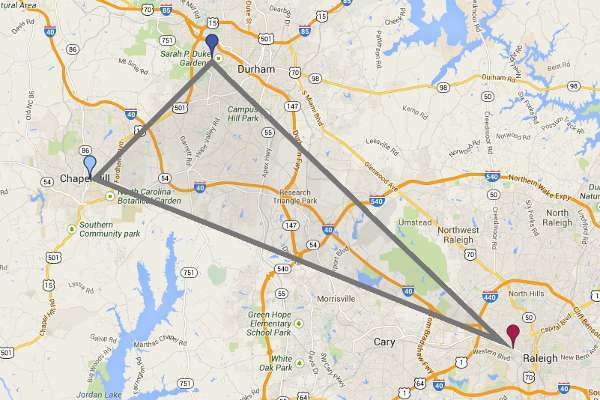 The region is technically the bi-polar metropolitan area, Raleigh-Durham, but the Triangle is conceptually defined by corners located at three important landmarks. These mark the major educational institutions at the foundation of the original idea: the Chapel at Duke University, the Old Well at the University of North Carolina, and the Memorial Bell Tower at North Carolina State University. The economic development area now known as the Research Triangle Park was the brilliant idea in 1954 to transform North Carolina from an agricultural economy to a technological one. The North Carolina population had nationally low income levels, education was weak, and the higher institutes of learning were disconnected. Inspired as a “golden triangle of research” by developer Romeo Guest, the effort to improve the state across many levels grew through the joint efforts of interested and notable citizens, including Wachovia Bank president Robert Hanes, governor Luther Hodges, Brandon Hodges, UNC president William Friday, and sociologist George Simpson. In 1959, the Research Triangle Institute began out of the joint UNC/NC State Institute of Statistics on the same site it occupies today. Chemstrand’s high tech facility opened in 1960 and illustrated the logical transition North Carolina needed to make from its textile manufacturing roots. 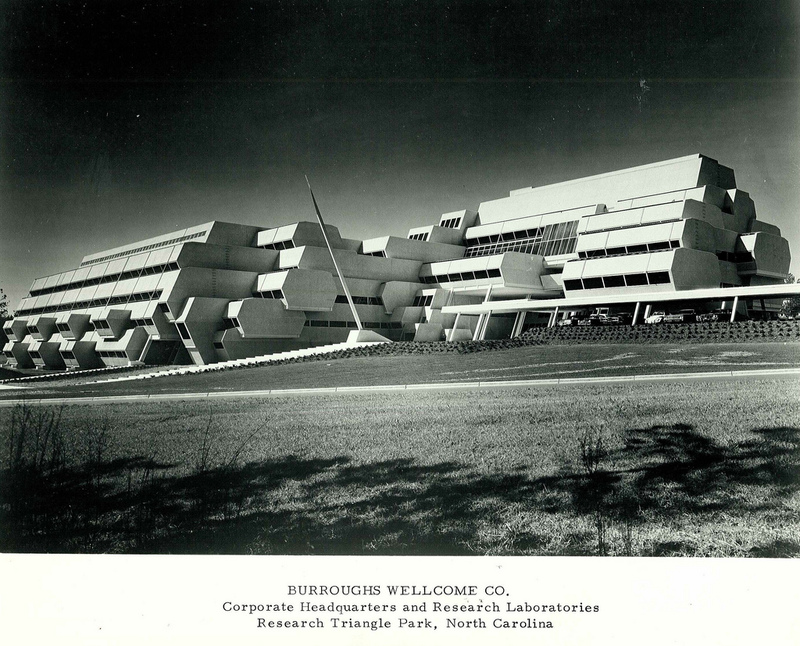 More tenants and facilities grew with the US Environmental Health Center (now NIEHS) in 1965, IBM’s purchase of 400 acres three months later, and the iconic Burroughs-Wellcome facility by Paul Rudolph in 1970, which was completed two years later. The video below was produced in the early 1990’s promoting RTP and has about 30 minutes of good background on the birth of RTP and interviews with some of the important players. Look past the styles and production quality and watch the most applicable portions from 6:32–37:51. As an architect, I find these influences interesting because they established the drive in the state to progress. This propelled architecture in the area as well, and the interest to become modern dictated local building style. A multitude of notable examples of modernism were created in the region, such as the Dorton Arena completed in 1952. Numerous houses and the NC State School of Architecture building by George Matsumoto still exist, as well as more homes by other recruits of the long time dean of the NC State architectural school, Henry Kamphoefner, himself of midwest modern influence. The Growth of Research Triangle Park (PDF), by Albert N. Link and John T. Scott, 2000. History of RTP, posted by Liz Goodwin on 2011-06-20. Accessed 2014. About RTP, by the Research Triangle Foundation of North Carolina, accessed 2014. Research Triangle Park, by the North Carolina History Project, accessed 2014. This entry was posted in Triangle and tagged Triangle, urban planning on 2014-01-09 by Steve Hall. Another interesting introduction to the Triangle can be found in David Kroll’s RTP: Research Triangle Primer at Forbes.com.